In any event, Chanukah is here and like many I wanted a wine that would go well with latkes. 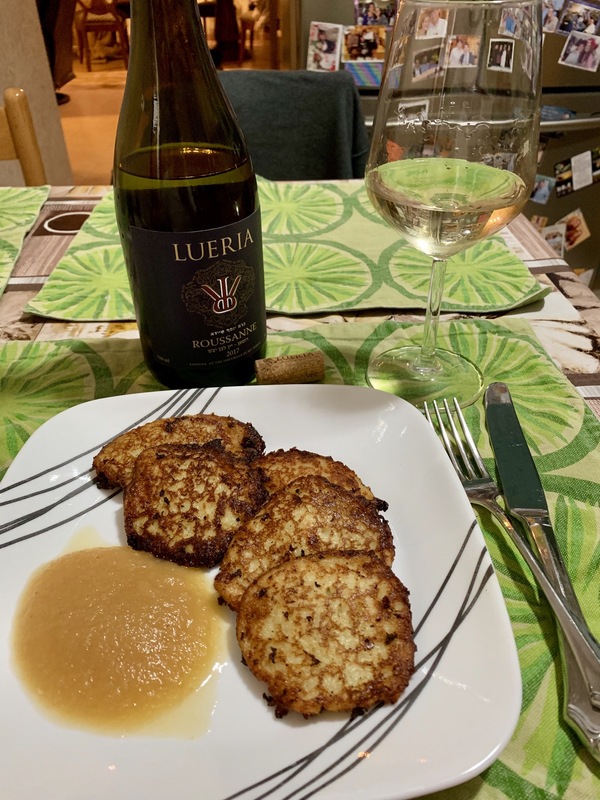 In my family latkes are always served with apple sauce so I thought of varietals that would go well with the whole package – the oil, apples, salt and rustic earthiness of the potatoes. Roussanne. Not sure why I never thought of it before. Right now Roussanne is having it’s time in the son. Never before have there been this many quality options. Netofa Tel Qasser is king of the heap right now 2 years running. Tavor Adama has provided a quality QPR option for years. Covenant Mensch is also nice, though a step behind. the other two. While last year’s inaugural vintage was nice, the 2017 vintage was all around difficult white wise in Israel and Lueria’s other two 2017 releases I have tasted thus far are a mixed bag with the Unoaked Chardonnay a winner and the Pinot Grigio well ,not (both tasted at the aforementioned massive blind tasting) – so I wasn’t sure what to expect…. The wine clocks in at a nice 13% ABV. On the nose very typical Roussanne with quince, lemon, honeysuckle and straw. In the mouth on first first the wine presented closed and the mineral/slate flavor was very dominant. A few minutes later when the wine had warmed a degree or two, it presented much more in balance – with apples, citrus, pears and followed by that great minerality and a touch of saline. The body was medium-full to full. Bottle mentions that it spent time in steel and makes no mention of oak – though if I was tasting blind, I would have guessed that it had spent a couple of months in wood. If there is a critique here it was that I thought it could have used a bit more acid – but overall this wine is nice – though a half step behind the 2016.